Lurking deep within the urban jungle is an insidious fiend. It preys on all; unwavering in its silent attack and constant assail against our very being. This threat lurks everywhere and impacts us equally regardless of income, education, or other social determinants. No one is immune to it and no one can really escape its powerful, yet silent, reach. Bombarding our skin from without, it reaches deep within us, filling our lungs and impacting us on a cellular level from within. It is so insidious and prevalent that the international community has drawn together to address it and fight it. The name of this horror – air pollution. Air pollution poses a significant health risk, particularly to those living in more urban areas. The US Census Bureau reports that 80.3% of all Americans lived in an urban area during the last census. 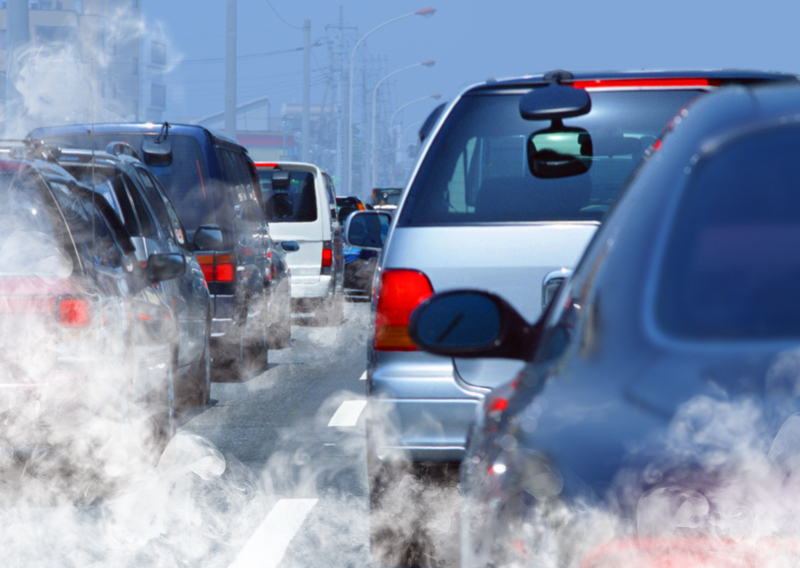 We often associate the risks of high pollution with serious diseases such as asthma or cancer. Pollution does also have a negative impact on our skin’s health however. Our overall skin health of course impacts the way we look, but on deeper level it impacts our ability to heal from injury, fight off infections, and, for those with chronic skin conditions, our appearance can have a direct impact on our confidence and self-esteem. Air pollution has been linked to a breakdown in collagen and elastin, general premature aging, clogged pores and inflammation. 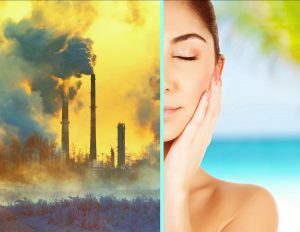 Ozone – Defender of the Earth or Destroyer of Skin? One of the main culprits of this air pollution and skin damage is ground level ozone. The ozone layer, high up in the Earth’s stratosphere, defends us from deadly UV radiation. Ground ozone however is not your friend. It is a danger to human, plant, and animal health. The Environmental Protection agency states that ground ozone is “…created by chemical reactions between oxides of nitrogen (NOx) and volatile organic compounds (VOC) in the presence of sunlight. Emissions from industrial facilities and electric utilities, motor vehicle exhaust, gasoline vapors, and chemical solvents are some of the major sources of NOx and VOC.” Ozone particles are colorless, irritating, and very tiny, sometimes 20 times smaller than your pores. Because of their size they can easily infiltrate the skin, causing not just surface damage, but also damage at the DNA level. South Florida’s high humidity increases the risk as hot humid air traps ozone and particulates closer to the ground, and us. Don’t be an Ozone Zombie – Fight off the Threat! Skin that is dry is more susceptible to damage in general. Well hydrated skin helps to maintain the skin’s normal barrier and defense against pollution. Use highly emollient products that are suitable for your skin type daily. Antioxidants and anti-inflammatory compounds. Antioxidants neutralize free radicals and remove them from the bloodstream while anti-inflammatories serve to, well, reduce inflammation. Besides causing undesirable swelling (puffiness) inflammation is linked to skin damage on a more cellular level. Popular ingredients to look for include Resveratrol, white tea, beet extract, and vitamins C and E.
Barrier bolstering ingredients. These ingredients help keep skin cells connected and reduce a pollutant’s ability to penetrate the skin. Look for glycerin, phospholipids, and ceramides. Essential oils are a great weapon in your pollution fighting arsenal. 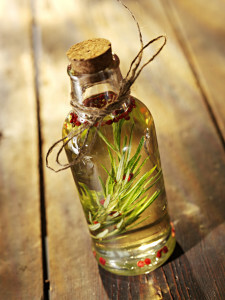 If you are looking for a do it yourself pollution fighter, look no further than your favorite aromatherapy provider. Putting together a facial or even whole body treatment is accessible to everyone. Pick a carrier oil from the list below and add 30 drops TOTAL of any of the essential oils to two tablespoons of base or carrier oil. Make this in small batches and be sure to store in sealed containers out of direct sunlight. If you are using it as a facial product, apply a small amount under your usual moisturizer or sunscreen. For a whole body treatment, apply all over and add a layer of sunscreen or regular body lotion on top. The list below is certainly not comprehensive, but represents fairly easy to obtain ingredients at a variety of price points. Remember that the scent and viscosity of your finished product will influence how much you like it and are apt to use it. For some people, the scent of coconut oil transports them away to a tropical paradise while for others the scent reminds them of a bad sunburn on a vacation gone awry! You will need to experiment a little to find the right blend for you. Of course there are a variety of commercially available skin care products that are great at pollution fighting. Be a discerning consumer however and don’t just grab a bottle that shouts out “pollution fighter”. Read the labels to see what ingredients they are using to tout that pollution fighting claim and check to see where in the list of ingredients the pollution fighter falls. For example, if Vitamin C is listed dead last on the list, give that product a pass. Below are a few products we like. When you follow the links you’ll also see the ingredient list for each product, a great way to check out high quality product ingredients and compare to your favorite or current products! Dermalogica’s Phyto Replenish Oil is packed with great barrier ingredients to shield the skin and can be blended with your current moisturizer for an effective, and simple, skin care regimen. Hylunia’s Ultimate AntiOxidant Cream uses glycerin to create a barrier and is rich in plant extracts to really pump up the antioxidant base. For full body coverage, we really like Source Vital’s line of body treatments. You can always purchase an unscented lotion and use it as a base to make your own essential oil treatment too. To see each products full ingredient list, select one and scroll to the bottom of the page. Enter your email to receive coupons, discounts, special offers and news from Balance Spa Boca Raton. What is Ayurvedic Medicine for?